I tried to get the measurements correct when Resa made the BBQ shrimp but she cooks like her dad, a little this and a little of that. Arrange shrimp in a glass baking dish. 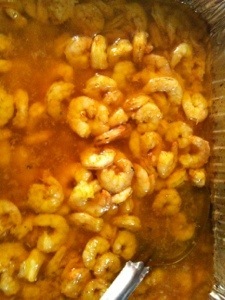 Pour butter mixture over shrimp. Sprinkle Lemon Beazell’s liberally over the shrimp, making sure to turn and sprinkle other side as well.